Cranky Fitness: Cheeseburgers can cause insomnia? Note: this is not Another Post Bashing Red Meat. In fact, the phrase "Red Meat" will be used only twice in this post, and you've already passed both usages. It's safe to keep reading. Do you want to stay up all night? 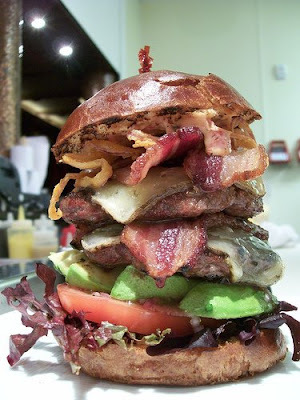 I stole leveraged this picture of a bacon-and-everything cheeseburger because it seemed the epitome of a high-fat meal. A study published in the journal Endocrinology claims that a high-fat diet can be bad for a new reason. Dr. Oren Froy, and a couple minions white-coated colleagues, studied a circadian rhythm ("adiponectin signaling pathway") that deals with glucose regulation and the oxidation of fatty acids. According to the study, if the test mice fasted, the circadian rhythm was delayed, while eating a high-fat (HF) diet advanced the rhythm. A low-fat diet did not affect the circadian rhythm either way. Their conclusion? "Changes in the phase and daily rhythm of clock genes and components of adiponectin signaling pathway as a result of HF diet may lead to obesity and may explain the disruption of other clock-controlled output systems, such as blood pressure and sleep/wake cycle, usually associated with metabolic disorders." 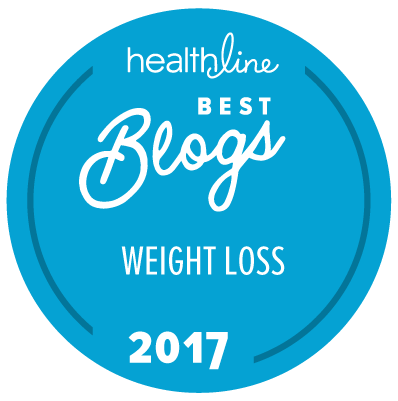 I knew that not getting enough sleep causes cortisol levels to rise, and the waist to get thicker, and other not-so-great results. It was new to me that an HF diet (hell, if the cool people in white coats abbrev. stuff, I wanna abbrev. stuff 2. I cool) would mess with the body's cycles such as the ability to go to sleep at night and get up in the morning. Besides insomnia, I don't like the idea of messing with the circadian rhythms in any case. To quote the blog Psychology, "The disturbance of circadian rhythms can lead to such phenomena as hormone imbalance, obesity, psychological and sleep disorders and cancer." Eating an HF lunch can cause me to crave the Zzzs during my afternoon meetings, but I thought that was normal. And I thought frequent bouts of insomnia were just my lot in life. Next time, I'll skip the pizza and take a walk at lunch instead. The nice part about being an insomniac is, you get to leave the first comment on a blog! Oh hell, I'm too tired to think about this right now. New babies *force* insomnia. I think higher levels of blood sugar or (BS) can cause one to feel lethargic and sleepy. So HF diets can lead to increased amounts of BS too. I have enough probs with the aging hormones effecting my sleep cycle along with all my other body parts!!! oooh I used to have insomnia and was just saying last week how, since weve had Toddler, NOT ONE BOUT. Well... I sometimes listen to people bragging about how little sleep they can get by on as if it's some kind of badge of honour... now I know, they must be the ones on these HF diets! (With logic like that I'm sure I'll qualify for a white coat soon). Me? Well I'm afraid that I just can't/doesn't want to stay up all night - not even to show how non lazy I am- because I just get downright cranky without sleep... and that maybe qualifies me to blog. Cranky - do you have to wear a white coat to do that? I'm following a low carb diet, which can be considered high fat at times. I personally don't fry everything I eat, but I am totally allowed to have sauces (like full fat caesar and lots of it! )...I have actually lost 22 pounds so far...but I do find it has affected my sleep a bit. As in...I am a much lighter sleeper these days. I used to sleep like a log, now I wake up fairly easily. However, I don't mind trading a few winks for a shrinking waistline! And since I cut out the bread for the most part, my skin is much clearer and I do not get the afternoon zombie-state!! I've never had problems with insomnia. I can sleep anywhere...but when I eat craptastic food I sure have trouble getting through the day without a nap. Eating poorly makes me lethargic and lazy. I like my sleep. Why people cut it out is beyond me - I have enough trouble getting up to work out in the mornings. I must say that I have observed myself getting old. Can't stay up like I used to. I personally am all in favor of sleeping in and coming in to work late. And leaving early. And taking a nap in the afternoon. And still getting a paycheck. For some reason, the boss doesn't agree with these ideas. Doesn't count if it's your own blog, Merry! After a meal like the one in the picture, I'd be laying awake anticipating the heart attack. But now I just lay awake anticipating sleep. Hmmm... interesting study! I probably eat more fat than than I did back in the nineties (though the vast majority of what I eat now is "good fat.") I still sleep well, so far at least. I wonder if the kind of fat makes any difference? Or maybe it's just my lazy, low-energy personality that's impervious to any attempt to rouse it from sleep? I'm guessing that the carbs have as much or more of an effect than the fat. Since I stopped eating the bread and so forth, I'm never sleepy in the afternoon (and I do eat a relatively high fat, because it's low carb, diet). Hmm. Fascinating. So this "HF" diet they used, did they make any distinctions between types of fat? Oops, I see Crabby McS already commented along these lines. But I'm wondering the same thing since I eat probably a high percentage of "F" than many people. You know what really messes up my sleep? Sugar. Totally throws off my circadian rhythms. Or is that something different? for me.. the picture of that whatever kinda burger that is actually made me sick to my stomach looking at it. I don't buy it. Most of these studies that look at "high fat" diets fail to control carb intake, so in reality they're testing a High Fat AND High Carb diet (i.e. Thanksgiving dinner, i.e. hello naptime), which is NOT the same thing as a strict HF diet. I'll believe the science when they actually give ALL the facts. I don't suppose you have a link to the full study text handy? I could only read the abstract. As previous posters commented I'd like to see how total caloric intake and carb intake were controlled in the high fat and low fat versions. I haven't noticed what I eat affecting my sleep one way or the other. But that's probably because I sleep like I'm dead. 4 kids. That's all I'm saying. My current way of thinking says "give me the teddy grahams and screw the walk!" But in 20 minutes I'll be heading out to workout with a gym buddy. Mm teddy grahams. There's all kinds of sleep issues related to the food we eat! I wonder how they even came up with the hypothesis that maybe sleep and HF were related. Perhaps a few too many burgers? I know when I load up on high fat foods, I sleep horrible, so it makes sense to me. Insomnia is awful. Luckily haven't had that problem in quite sometime. Not gonna start now. Although an occasional fatty diet makes me sleepy weird. I guess the key word is occasional. see everything in moderation. I'm a famously lousy sleeper; a fact about which I am not proud. I've been to a sleep clinic, tried pills (I hate them and quit almost immediately) and have even worn a C-PAP machine for sleep apnea. None of it worked. I've been known to mow down a burger like that every once in a while and can see how it could keep you up at night. My problem isn't falling asleep, it's that I wake up numerous times during the night. My totally unprofessional opinion is that it's stress and that I have not yet learned to manage it properly. I've made strides, but I have not yet committed myself to a regimen of stress management with as much regularity as it requires. I exercise and eat fairly well, but I think we could all use more stress management via meditation, taking more time for recreation and vacation, and somehow learning that most of what we stress about either already happened (and thus can't be changed) or has yet to happen (and is thus fantasy). I have no problem eating high fat and falling asleep. I do eat high (healthy) fat as my normal diet. But put a pinch of sugar down my throat and I know without a doubt I will be up all night. Cereal, bread, potatoes, milk..all the same thing. Causes me bad insomnia, a break out of acne, a swollen belly, and a case of Iritis down the road. ALL having to do with inflammation from those foods. I got rid of IBS from stopping eating those foods for 2 years...not one shred of those foods entered my body. Now sad to say I binge on them every so often. I want to stop..I want my health back. If you are suffering from sleep problems such as insomnia or obstructive sleep apnea, you need to consider this problem seriously and adopt specific measures at the earliest to get back your sleep. Regular exercising is one of the options to ensure sound sleep at night. Altogether, if you are unable to get adequate sleep during night, you can undertake certain initiatives to overcome your sleep problems such as fixing your sleeping as well as waking schedule and abstaining from alcohol, nicotine, tea, coffee et al before hitting the bed. Well, I'm pleased that there is some reasoning as to why it happens. For me, it happens when I have too much fat or if I have cow meat too late in the evening. I think having the heavier meal in the middle of the day is better for people prone to this problem... In any case, it's time for me to rethinking my evening meal.